A new image has appeared on the official Injustice: Gods Among Us Facebook page portraying four tiny sections of upcoming, as yet unrevealed DLC costumes for the fighter. That image you see at right would be the picture in question. You can find a larger version of it on the Injustice Facebook page. Now that you have a clear idea of what we're discussing in your head, it's time for wild speculation. 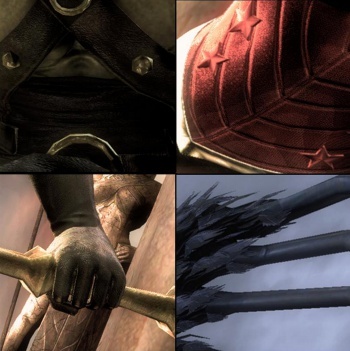 If I had to guess, I'd say that the characters in those images are Bane, Wonder Woman, Green Arrow and Raven. The details just don't really match up with any other members of the Injustice roster. Anyone care to disagree? Digging into more specific territory however, we're drawing a blank. All of the costumes released for Injustice to date have their roots in one DC Comics event or promotional tie-in, so it just makes sense that these new outfits would also hail from some part of DC's superhero continuity. Unfortunately, either I'm losing huge chunks of geek knowledge or those images are too small to glean a solid idea of what we're looking at. Either way, I've got no idea what we're actually looking at. This is where you guys come in. By virtue of your presence here, it's safe to assume you have some geeky leanings, so at least one of you should have an encyclopedic knowledge of the DC Universe, right? So here's your quest: Figure out where each of these four costumes comes from, and then when the DLC costumes arrive (we're expecting next week) you'll win almost nothing. I say almost because you will earn geek cred, but just don't expect us to give you anything of actual societal worth. Look, I didn't say this was going to be a fun game, alright? Now get to guessing. Comments are below.